ABA Negotiation Competition: Also part of the ABA Law Student Division, in this competition, students practice legal negotiation in a variety of legal matters. The competition features two teams of co-counsel who negotiate a settlement of a legal matter on behalf of their respective clients. This competition is hosted regionally in November each year. ABA Representation in Mediation Competition: Sponsored by the ABA Section of Dispute Resolution, this competition has its focus on the ability of lawyers to effectively represent clients in mediation. Teams are comprised of an attorney and a client. 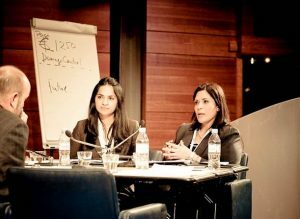 The interaction of lawyer and client along with interest-based problem solving is the foundation of this competition. This competition is hosted regionally in late February or early March each year. The winning team from each region competes in the National Representation in Mediation Competition at the Annual ABA Section of Dispute Resolution Conference held in April. Abrams National Mediator Competition: This competition is sponsored by the University of Houston each fall and tests students’ mediation skills. Students compete only as the role of mediator. 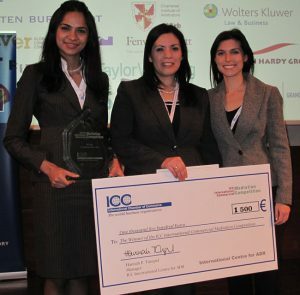 ICC International Mediation Competition: Modeled after the national ABA Representation in Mediation Competition, this competition is sponsored by the International Chamber of Commerce. Universities from around the world compete in Paris each February. 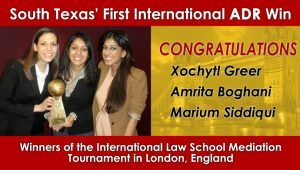 Teams are selected by invitation only, and STCL has participated since February 2008.
International Law School Mediation Tournament: Sponsored by the International Academy of Dispute Resolution, this competition focuses on training and practical experience. During the first half of the tournament, students participate in advocacy training, mediation training, and cross cultural dispute resolution training. Following the training, students compete against schools from around the globe. Teams consist of three students and include an attorney, a client, and a student mediator who is paired with a co¬mediator from another country. Securities Dispute Resolution Triathlon: The Securities Dispute Resolution Triathlon is sponsored by the Hugh L. Carey Center for Dispute Resolution at St. John’s Law School and the Financial Industry Regulatory Authority (FINRA). 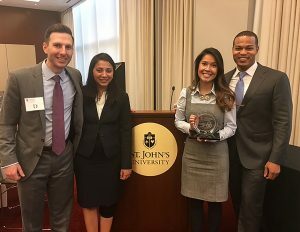 For two days, student teams from law schools around the country meet in October at St. John’s University in New York City to test their advocacy skills in the negotiation, mediation and arbitration of a securities dispute. Sports Law Negotiation Competition: The annual National Sports Law Negotiation Competition is hosted and organized by the Center for Sports Law & Policy at Thomas Jefferson School of Law in San Diego, California, every September. The fact patterns for the Competition are modeled toward current issues in the sports industry. Teams of student competitors negotiate fact patterns focus on issues such as contract negotiations, trading of players, salary demands, endorsement contracts, intellectual property, and more. STCL Houston Energy Law Negotiation Competition: South Texas College of Law Houston established this competition in 2015. The competition features two teams of co-counsel who negotiate settlements of energy issues on behalf of their respective clients. An extensive group of expert attorneys from local energy companies and law firms participate as judges. Transactional Negotiation LawMeet: This competition is co-sponsored by the STCL Transactional Practice Center and the Frank Evans Center. The primary goal of the LawMeet is to provide students with an engaging simulation of transactional practice. The LawMeet involves three distinct phases. First, students work in teams to draft a transactional agreement. Then each team completes a mark-up of one of the opposing team’s drafts. Lastly, opposing teams meet in person to negotiate the deal. The last several years have been fantastic for the ADR competition teams! Thank you to all who have helped our teams have successful years. 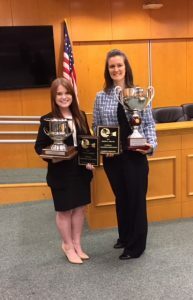 STCL students, Mildred Scott (right) and Ashley Thomas (left) win first and second place at the Abrams National Mediator Competition on October 21, 2017. Students Chris Piper (far left), Urvashi Morolia (second from left), and Lionel Sims (far right) celebrate their 2016 national championship at the St. John’s Securities Dispute Resolution Triathlon in New York City with their head coach, STCL Houston alumna Lynn Nguyen (’13).